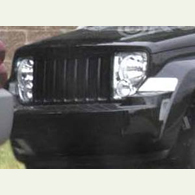 (autoinsidernews) - Spy photographers caught another prototype of the 2008 Jeep Liberty, this with minimal camouflage. for the very first time. The last time we saw a Liberty prototype it was heavily disguised but a resemblence to its Dodge Nitro sibling was clear. Without the camouflage, the unique Jeep styling cues many borrowed from the Commander can clearly be seen, and an overall look that is much more masculine than the current model, reports Trend. The 2008 Jeep Liberty will have a longer wheelbase and longer rear overhand, which means it's longer overall. Besides the benefits for passengers and cargo, the longer overhang means the spare can be relocated from the tailgate to under the vehicle. These changes allow the 2008 Liberty to have a rear hatch that lifts vertically instead of the swing-out tailgate on the current model. The 2008 Liberty is expected to be offered with a single powertrain, the 3.7L V6 and four-speed automatic, but will likely feature the same safety techologies including stability control with Electronic Roll Mitigation, and hill descent control. The Liberty is also likely to move upmarket with additional features like a Load 'n Go rear cargo slide out system, rear DVD video, and remote start available at the factory.